In the heart of Munich, state-of-the-art in every aspect, with a view of the city from above. Open kitchen – private party. Everything you desire – all for one rate. Our concierge looks forward to welcoming you and is happy to fulfil your wishes. The Living Room, with its casual and open atmosphere, is the perfect setting for exchanging ideas. The Wine Room boasts a selection of excellent wines and an unequalled view of the Marienplatz. The Kitchen is open to you at any time. Feel free to help yourself – to a gourmet breakfast or a midnight snack. 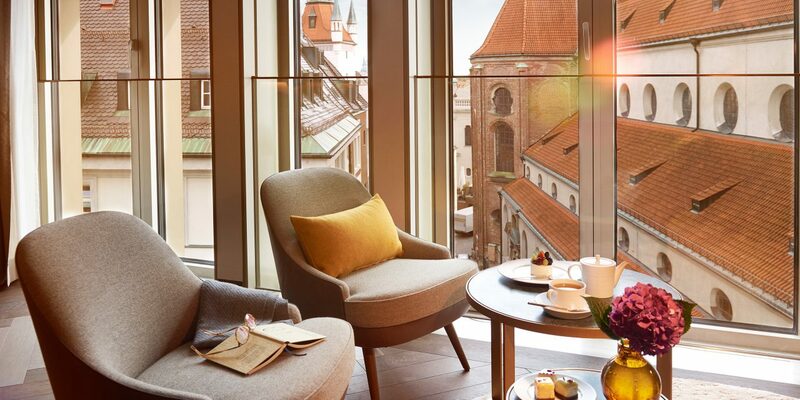 The BEYOND is more than just a luxury hotel in Munich: It is your home – with Munich’s Marienplatz right at your feet. Well thought-out design, modern comfort, exclusive company and the feeling of being among friends. Should you fancy some privacy, your bedroom is the perfect place to retreat. If you’re in the mood for some company instead, the BEYOND boasts three open spaces that offer the opportunity to mingle with like-minded people and get inspiration from vivid conversations. There hardly is a luxury restaurant in Munich that serves better food: Because nothing tastes as good as your favourite meal – and that’s exactly what our private chef will gladly prepare for you outside of our culinary package. At the BEYOND, you are guest and host at the same time. You can book a room, but also the entire residence. Receive your friends at this exclusive location – the city’s old town and the Viktualienmarkt are right at your feet. Always at your service: Our concierge has gained experience in the most distinguished hotels and he knows every restaurant and every hot spot in town. He will make your stay in Munich a smooth one, day and night. Welcome in Munich’s city centre, to a place where the gourmet kitchen becomes a meeting place, the hotel lobby a living room and the suite your bedroom. Welcome to the BEYOND! JUST WRITE AN EMAIL OR CALL. WE'RE ALWAYS HAPPY TO HELP!